Because of the popularity of our lead carbon batteries. Likewise SOLARWYSE offers a $500 shipping savings. On the Sacred Sun FCP series batteries. The lead carbons are the longest life battery as a result are in great demand. With attention to proper settings and maintenance, lead carbon therefore should last up to 20 years. Both of which are equally important as far as life expectancy and safety is concerned. Sacred Sun lead carbon technology for this reason surpasses the Tesla Lithium battery technology. The use of lead increase the weight therefore lead carbon shines as an off grid battery bank. SOLARWYSE offers a $500 savings on shipping to anywhere in Canada of course saving you money . All the solar panels charge these batteries perfectly. Your purchase of lead carbon batteries not only includes racking as well as electrical buss bars not to mention a safe and secure battery bank. Assembly is modular, thus designed for ease of installation by the DYI home owners. Batteries are 2 volts each, and also available in 500 or 1000 AHr storage. Therefore a 24 volt bank would be 2 rows high. Increasing to 4 rows for the 48 volt bank. Impervious to sulphation, the bane of the lead acid and AGM technologies. On the positive side these batteries draw down safely to 40% state of charge, as opposed to 80% for the original batteries. Thus contributing to their extended life. Moreover this advantage allows for a much higher charge density resulting in greater capacity. The deep cycle solar battery commonly used in off grid can charge for 3000 cycles rather than the Sacred Sun 7000 cycles. This is over double the life expectancy. The AGM battery life is around 10 years, however the lead carbon is around 20 years. 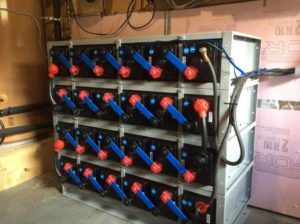 Do not miss out on this $500 saving in shipping costs, these batteries are warehoused in south central British Columbia. Sale of solar panels have skyrocket over the last few years. It can become confusing what panels to buy, should it based on solar panel cost or quality? Where are the best solar modules for Canada made? Many questions, but how to avoid the confusion. The major concern should be workmanship; how will our harsh winters affect operation. Stick with Brand Names ensure that you select a module that carries at least a 25-year warranty. Industry standard on warranty requires no less than 80% of the published output. Look at the frame is it solid and built to withstand rain and hail. Does the panel have tempered glass? It is hard to find poor quality solar panels on the market today. Exception would be off brand names found in most box stores in Canada. Cost of quality solar panels are often better than run of the mill. Each manufacture has different variations in the electrical specifications. Minor difference but capable of reducing efficiencies if mixed. It is important to select modules that are common and available. Once again a common brand named source. Modern MPPT controllers must have a balanced string in both amperage and voltage. Oddball panels may be difficult to replace. Solar panels for sale in Canada are among the highest quality as long as purchased from a solar provider. Cost of quality solar panels for sale on the market today are very reasonable. Also they are well priced between suppliers. Ensure if that lower price modules are a quality module available with full warranty. Sometimes you can get a deal with yearend over stock. Know your panels! While your looking have a gander at our solar panels. We carry high quality and brand named solar modules at a fair market price. our Solar panels are selected based on availability, not to mention 25 year warranties. Our modules are designed to withstand the Canadian winters along with the winds and hail. Selected for both high efficiency coupled with pricing and reliability, you can’t GO WRONG! Canadian Solar a manufacture of one of the best solar panels world wide.